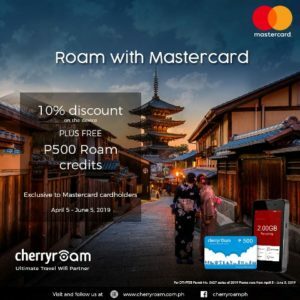 CherryRoam and Mastercard team up to offer exclusive deals to all Mastercard cardholders in the Philippines. Customers can save up to 10% off and receive P500 worth of free credits when they purchase a CherryRoam device using their Mastercard. With an original price of P6,990, the CherryRoam device is now only for P6,290 when purchased using a Mastercard. Teh free P500 credits can be used on your trip abroad. CherryRoam allows users to upload real-time vacation photos and cherished moments with loved ones anytime, anywhere in the world. The travel WiFi roaming device provides up to 4G LTE connectivity with fast, stable, and secured internet connection to over 100 countries worldwide. With a large 4-inch touchscreen display, the device allows users an easy way to keep track of data usage with real-time monitoring. It comes with a Qualcomm 4G LTE chipset that allows a high-speed 4G WiFi connection with up to five devices. 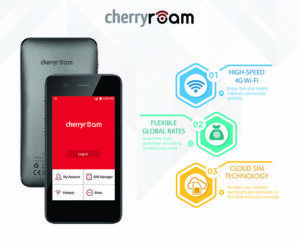 The CherryRoam also allows users to connect automatically to the best network coverage with its CloudSIM technology. As a bonus feature, it also doubles as a power bank with a capacity of 5,300mAh. To take advantage of the offer, visit CherryRoam’s website here. On the site, you can order the device and have it delivered free to your homes in time for your trip. This exclusive promotion is open to all Mastercard credit, debit, and prepaid cardholders nationwide. The promo runs from April 5 until June 5, 2019.